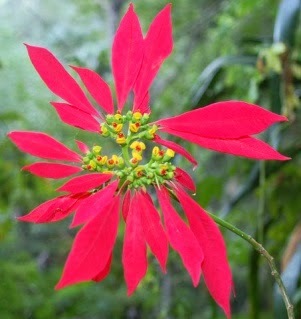 The Poinsettia (Euphorbia pulcherrima) is a shrub in the Euphorbia family native to Mexico and Central America. So we know that it wants a warm home. In fact it grows best at temperatures of 20C daytime and 16-17C nighttime. Exposure to cold, even for a brief period, causes it to droop and lose its leaves. So choose and transport your Christmas plant keeping it cosy. 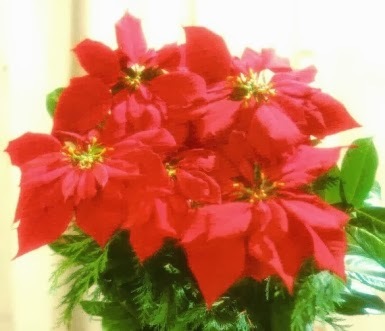 The brightly coloured parts of the poinsettia are not the plant’s flower. They are actually modified leaves (bracts). The flowers are the yellow-green knobs at their centre. Poinsettias exhibit photoperiodism flowering in response to day length. To begin flowering they need 12 to 14 hours of uninterrupted darkness for 7 to 10 weeks. They bloom when nights are long and days are short. The true flowers fade quickly but the coloured bracts last for four months. This makes them ideal for indoor colour in winter. - Place your plant where it will get as much indirect sunlight as possible. Choose a place without drafts, hot or cold. - Water it sparingly allowing the soil surface to dry out slightly between watering. - There is no need to add fertilizer until April when 20-20-20 will help new growth along. It is fun to try to keep your plant from year to year. I had one re-bloom for five years until it got nipped by a late Spring frost in the garden. The secret is to prune it and repot it in late April. Cut it back by a third and mist it well. (The cuttings can be rooted as well.) Fertilize it once new growth appears. Set it out in semi-shade when all risk of frost is past and the temperatures in the 20C to 24C range. Water it as needed to prevent the plant wilting. Add a soluble fertilizer (20-20-20) every two weeks. Shape it with a second gentle pruning in July or early August. Never prune after September 1st. Bring the pot indoors in early September. From mid-September to mid-November allow it bright light for ten hours followed by 14 hours of total darkness daily for eight to ten weeks. This can be done by covering the plant with a black garbage bag each night and removing it each day. Or you can place the plant under a box or in a cupboard at night and put it under a light each morning. Remember that even the light from a streetlight can ruin the dark cycle. Fertilize it with 15-15-30 bi-weekly from early November to foster bloom formation. Then enjoy your Christmas blossoms. Of all the potted plants sold at Christmastime the most popular is the poinsettia. More than 65 million are sold every year in the United States alone. But do you know their origin? Poinsettias (euphorbia pulcherrima) are native to Mexico and Central America where they grow wild as a bush up to 3 metres high. The Aztecs knew these plants as cuetlaxochi and considered them a symbol of purity. 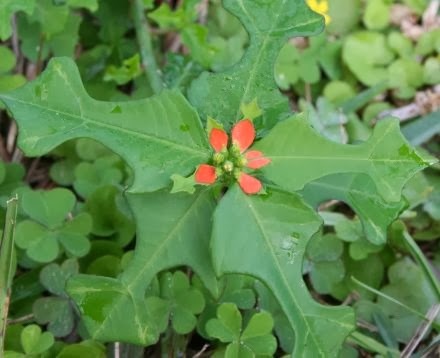 They used the milky sap to treat fever and the red bracts for dye. In the 17th century Franciscan monks chose them for their Nativity procession because their bright colour in the winter months. A legend sprang up: a young girl, Pepita, was walking to mass on Christmas Eve unable to afford a gift for the Christ Child. Her cousin, Pedro, comforted her saying that any gift given in love would be acceptable in His eyes. She gathered some leaves from a straggly bush and humbly set them down. At that moment the leaves turned brilliant red and from that time on poinsettias have had red bracts. 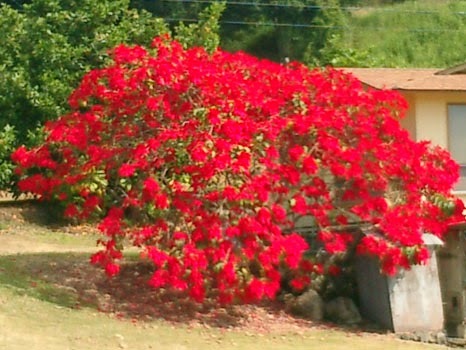 The flower became known as “Flor de Nochebuena”, or “Flower of the Holy Night”. The bushes caught the eye of Joel R. Poinsettia, the first American ambassador to Mexico , 1825 to 1829. Poinsettia, a scientist and botanist, sent some plants home to South Carolina, thus introducing them into the States and giving them their name. He propagated them for his personal collection and started giving them to friends and to botanical gardens. Soon, the cut flowers appeared for Christmas sale in Philadelphia and New York. The modern era of poinsettia culture began in 1923 when the “Oak Leaf” cultivar was introduced. This was the first cultivar to retain leaves on the flower stem. Wild plants bloom on leggy naked stems. In 1930 pink, white and variegated cultivars appeared as well as double varieties. Until 1950 the flowers were sold as cut flowers or grown as shrubs. Since 1960 the many new cultivars have adapted the plant to growth in pots indoors. To-day their bright bracts say Christmas and light up the dark December days. Colour Paradise has sponsored a Christmas Wreath auction for a number of years in support of the House of Friendship and groups in the region are invited to create and donate a wreath to the auction. 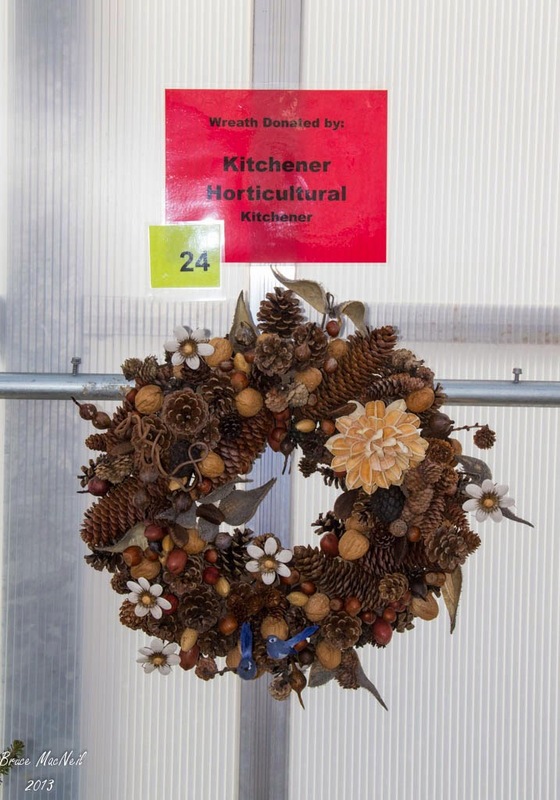 This year the Kitchener Horticultural Society decided to submit a wreath and Al Shivas designed and created the wreath you see above. Most of the items that you see in his creation were collected from around the gardens while others were found nearby. The petals on the daisies are pumpkin seeds that were spray painted and attached to Teasel and a nut was glued to the center. Al admits that the Dahlia was a purchase from Michaels but he says that the most difficult part of building this wreath was catching and wrestling those little BlueBirds to the ground. While our annual and perennial flowers provide us with a cornucopia of colour throughout the Spring and Summer, it is the leaves and foliage that provides the colour in the Fall. 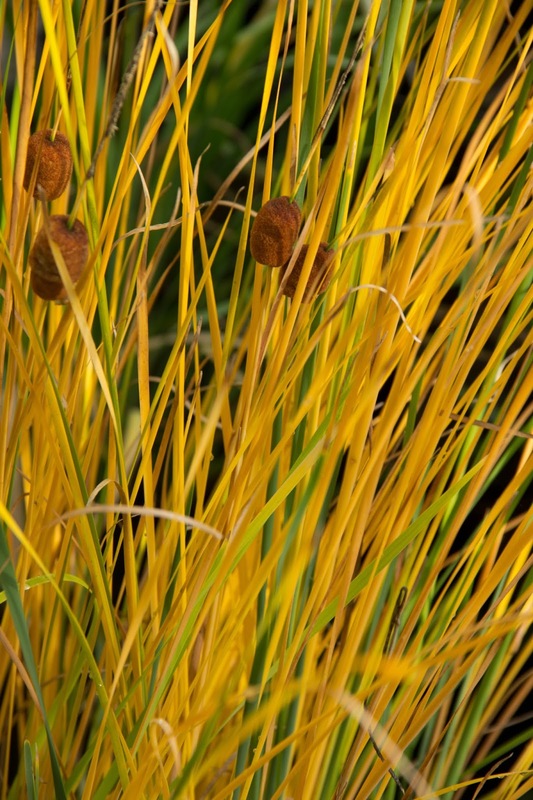 In our pond, we have some miniature cattails that turn a gorgeous bronze colour (at least I think it is bronze). 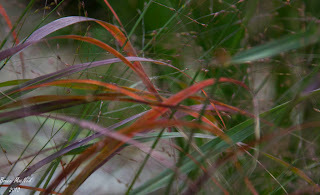 Then there are many grasses that add to the Fall colourscape. There are the Fountain grasses that we all purchase for our containers in Spring and early Fall but one that I particularly like is the Calamagrostis x acutiflora 'Karl Foerster'. I really like its compact upright habit. But there are many others to choose from. 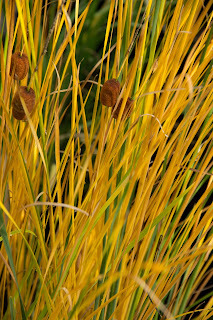 One that I can no longer remember the name of in our garden turns reddish in the Fall and has attractive seed heads. But don't take my word for it, check out your neighbours gardens and see what works for them. No doubt someone has shared a beautiful Fall photo with you or several of them at some point. The reds and yellows are particularly attractive and we often think about the Sugar Maples in our landscape. But what about your own garden? There are a number of trees and shrubs in our garden that provide some gorgeous colours. 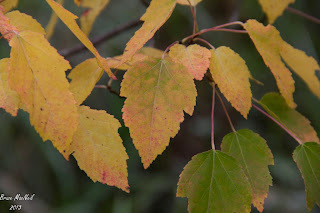 There is a Clethra alnifolia (Summersweet) that is in a container that is hauled in and out of the garage at critical times of the year and a Cornus sinensis (Chinese Dogwood) both of which have interesting Fall colours. The one I wanted to mention in this post though is the Acer tataricum ssp. ginnala (Amur Maple). We have one that has been in a container for over 10 years. I purchased it in my Bonsai phase and wanted to keep it long enough to create a miniature. Well I've had it long enough but the phase has phased and the poor shrub is still in a container waiting me out. The Amur is a small shrub and year after year it rewards us with the same attractive orangish yellow leaf colours. There are other varieties now that promise even more vibrant colours such as Flame. It is a good shrub to consider for our smaller suburban gardens. Check it out. A few years back, we lost almost every fish we had in our pond. Whether it was a muskrat or a Heron, we're not sure. We did a lot of research to find some way to protect our fish and it wasn't until we made a visit to a local nursery that we were presented with a very simple solution. A few pieces of plastic weeping tile down at the bottom of the pond provides your fish with a place to hide when danger lurks. Haven't lost any fish since or at least we haven't lost any in the numbers that we did at the time. That leads to thoughts of over-wintering your fish outdoors. Here in the Kitchener area, if you plan to over-winter fish outdoors, your pond should be 3 feet deep. Early in our pond experience, in October or November, we would catch all of our fish and bring them into the house where we kept them in several large tanks. 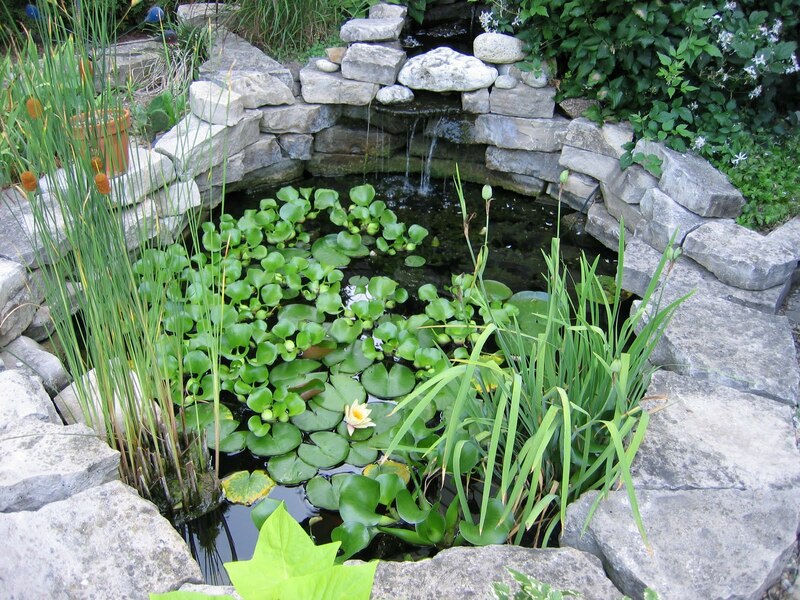 Then we would remove most of the water, clean the pond and then refill it. So much work!!!! Now, I'm thankful that we had the smarts to dig the pond deep enough to keep the fish through the winter without having to bring them indoors. The only other thing you have to do to protect the fish through the winter is to ensure that there is an opening in the ice which allows the methane to escape. We use an agricultural heater that is used by farmers to keep water troughs open for their livestock. 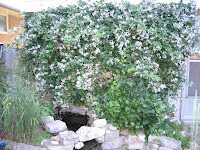 The other day, I was cleaning up the garden and the day's project was to prune several Clematis. If you have some of your own, you know that there are three Groups (A - those flowering in early Spring on the previous season's growth, B - those flowering on previous season's growth and then again later in the season on current year's growth, and C - those that produce flowers on current year's growth each year). Some authors even refer to a fourth Group. In any case, each Group is supposed to be pruned differently. I have found though that if you forget what Group your Clematis belongs to, the plant itself will show you where to prune. I have a C. terniflora that in mid-May begins to produce leaves as high as 6 feet above ground level. That's where I prune. Two others, C. texensis 'Dutchess of Albany' and C. x durandii, usually are leafing out at between 2 and 3 feet above ground level. That's where I prune. Yes I know, all three Clematis belong to Group C and 30 inches is about where they should be pruned but I prune the terniflora much higher. If you are not sure whether you have a Group B or C Clematis, you will be OK if you prune 30 inches or higher. Group A can be problematic though as it should be pruned after flowering in the Spring but no later than July as you want it to have enough new growth before Winter to flower again in the Spring. That may be where I went wrong with my C. macropetala and why I no longer have it. I’m often asked what I do in the Winter now that the ground is frozen and can’t get digging in the soil. While there is lots of thinking, planning and reading going on, there is much, much, more. In addition to the administrative activities of the Horticultural Society and the Master Gardeners, we are in the midst of planning our Seedy Saturday and a Design Seminar and all that goes with these events. The Horticultural Society is planning to host the Ontario Horticultural Association District 19’s Annual General Meeting in Kitchener for April. On a personal note, I am involved with the Kitchener Horticultural Association and the Kitchener Master Gardeners. At a minimum, there is one meeting a week for each group. For the Horticultural Society I prepare the bi-monthly Newsletter “Growing Thoughts” that takes a minimum of two days every other month. In total, I give each organisation about 250 volunteer hours a year. Included in these totals is about 4.5 hours weekly of Horticultural Therapy programs at Freeport Hospital and Winston Park Nursing and Retirement Home in Kitchener. While I count only 4.5 hours for each of these activities, they take up a half day of my time for each location. In addition, I have the equivalent of 24 trays of plants under lights in my basement either for the 3 Horticultural Therapy programs or for my summer containers. There are more plants being overwintered in the garage that need watering from time to time and bulbs, tubers and corms in the cold cellar that need checking. Enough already you say, not quite I say. There are still our house plants about 12 orchids (5 varieties) and a number of other houseplants that include 2 thirty five year old Jade plants. So that’s how I practise my hobby in the winter time. Have you made any? I wasn’t going to but then again, one of the things I have been beating myself up about is the blog. The writing has been sporadic yet I know that there are some of you that have been following the blog. So here goes. I am going to write a minimum of once a week for the rest of the year. You’ll notice I didn’t say try. My wife says that the word ‘try’ is a cop out. You are either going to do it or not – ‘try’ is the cop out. The next entry will be the one for the first week of the year. If there is a second this week, consider it a bonus. At this time of the year, we are frequently asked "what's in bloom". I think the question really means "What makes your garden interesting at this time of year?" While there are still some flowers in bloom, they may not be their most attractive at this time. I still have asters, Japanese anemones, bugbane and sedum in flower and if you look closely you can see Johnny-jump-ups sticking their heads up. Behind a pine, there are even some phlox in bloom. Oddly enough, a summer clematis that I had cut back because I thought it had died has now produced some blooms. The obedient plants have the occasional bloom as does the rose mallow and the lamium but most other perennials have stopped blooming. However, if you've done things well, there are many other plants that have attractive features that provide interest at this time of year. Many of the containers still have annuals with blooms and interesting foliage. One container has a dahlia in full bloom with a purple flowering plectranthus (why the common name is Swedish Ivy I'll never understand) and the light green sweet potato vine. Other containers have some gorgeous foliage annual geraniums that are still in bloom. The leaves of the Summersweet (clethra) are a pretty yellow colour and those of the white edged euonymus are always attractive. Seed heads on the Clematis texensis are always interesting as are the various evergreens shrubs that have been placed around the yard. This is the time of year when you really appreciate having taken some time to plan the garden for more than just the summer.